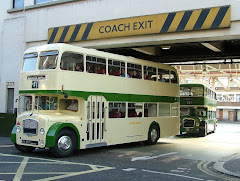 The BusWorks is once again a bit of a mecca for Routemasters. The latest one going through the works is RM348 for Burton Agnes Hall, near Bridlington. After several years of outdoor storage, the bus looked in a sorry state - despite being one of the Arriva London refurbishments from as recently as 2002 and generally operated on the 137 service. Despite being refurbished in 2002, RM348 was withdrawn by July 2004 after route 137 was converted to OPO and later passed to Burton Agnes Hall, via dealer Ensign. Seats were removed and the bus was initially used as a stationary art gallery for artists to display their paintings. However, as the appearance deteriorated the Hall decided to get the bus spruced up for 2011 and mechanically sound once again. The BusWorks is therefore overhauling the brakes and steering for MOT work and repanelling the bus. RM348 will return to use as an art-gallery for 2011 summer season, but at the end of the year it will return to the BusWorks to be internally restored so it can once again be used as bus in 2012. Bristol J gets ready for all the fun at the fair!